Doncaster RLFC head coach Richard Horne is considering changing his selection policy in the second half of the club’s Betfred League One campaign. Horne has regularly rotated his squad in his first full season in charge but hinted ahead of Sunday’s testing trip to Workington – which marks the midway point of the league campaign - that things could change. 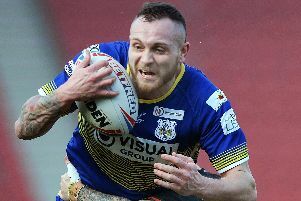 Horne, meanwhile, is hoping to extend the loan spell of 20 year-old Hull FC prop Lewis Bienek beyond the initial one-month deal originally agreed with Super League outfit Hull FC. Horne has been pleased with the impact that the former London Broncos forward has made since joining the club at the start of the month. “Lewis is a big threat (to defences) when he’s got the ball and he’s getting better each week,” said Horne. “He hadn’t played for eight weeks before he came here and was obviously a bit short of match fitness but he played for 35 minutes in the first half on Saturday. Another Hull forward to impress Horne at the weekend was prop Ross Osbourne. “The stints he’s had have been really good but he’s just been picking up injuries so he’s not been able to string a couple of games together,” said Horne. “I thought he was really strong on Sunday.